At 1255 22nd Street, NW, Washington, DC 20037. Design firm, MTFA Architecture, will conduct a tour of this adaptive reuse project and talk about the full scope of work from early concept through construction. Originally an outdated office building, Legacy West End is now a modern, amenity-filled apartment community located in the center of Washington, DC. The surrounding walkable neighborhood is close to shops, restaurants, parks, offices, and public transportation. The spacious apartments are filled with natural light and feature tall ceilings, sliding-glass barn doors, floor-to-ceiling windows, and private balconies. Building amenities include a rooftop deck with panoramic views of the city, two swimming pools, fitness center, and a club lounge. Designed to LEED® standards, the building features Energy Star® appliances and all new HVAC and electrical systems, plumbing and elevators. Tour leaders are Brian Vassallo, AIA and Dale Leidich, AIA. • Consider how buildings can be repurposed and adapted for new uses and the design challenges that accompany this kind of project. • Review current design and building code considerations for multi-family buildings, especially related to projects for adaptive reuse and compatible additions. 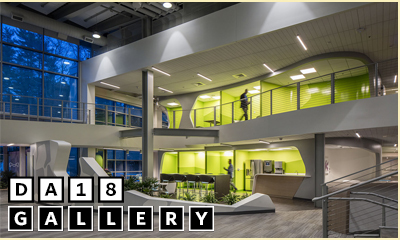 • Examine how programming and building design can maximize the development potential of a site while designing for LEED standards and maintaining open space for access to light and views. • Explore the unique benefits and challenges of construction projects in dense urban areas, including the use of bonus density and integrated zoning.